Craig Johnson is coming to Ten Sleep! The author of the popular Longmire mystery series lives just over the mountain in tiny Ucross, and he tours worldwide… but he’s coming here! Technically, he is coming to Washakie County for the One Book Wyoming series that is being held in every county… So he’ll be in Worland as well… but, hey! He’s STILL coming to Ten Sleep again! So… as often happens at the library, I get to make the poster. Other things preoccupied my time at work, so today I was going to create it at home. Could I have whipped up a poster on the computer? Sure. But Carol had to make it difficult. Carol told herself not to do ANY ARTWORK in the studio until it was FINISHED. Carol told herself that zentangle, though it looks like fun, is VERY time consuming. Carol doesn’t listen very well. The novella that was chosen for the One Book Wyoming program is this one. I haven’t tried zentangle yet, but, pshshhsh! I just jumped right in! For those of you who don’t know zentangle, one of my pysanky students told me about it. It is quite similar in many respects. Think of it as fancy doodling. Many people link the “zen” to the “tangles”, or doodles, because they find it relaxing. Here’s how it looks tonight. Still incomplete, but awfully close. Now if you read the book… you’ll notice a few things. The Dickens quote that is found five or six times in the book. Steamboat, the bucking horse the bomber was named after. A chain that holds the Steamboat horse charm along with beads and a few tin cones. The blizzard that threatens their lives. A flower with rays coming out of it, symbolizing Amaterasu, Japanese goddess of the heavens. Trails and webs, symbolizing how lives cross and recross. One Book Wyoming’s official logo, blurred behind the spinning prop of the plane. The padded quilting of old blankets. The call sign RaiderN4030LC shades the underside of the bomber. I have a couple of more ideas… there’s more space to fill… but there’s no rush. My goodness this was FUN! Even if I did get a kink in my neck from working on it all day! It’s my first official artwork completed in my (unfinished) studio. I can see more zentangle in my future! And I may just put it on display at Mr. Johnson’s One Book Wyoming visit! Great job! This looks really cool. You need to get it autographed. I bet he would enjoy seeing it. That is gorgeous! I agree with the others, you must get him to autograph it, and yes it should be the official poster! Where do you find the time to do all the things you do? I just do stuff… I was told once that to kill time you should work it to death… but, believe me, I have plenty of slack time too! That’s fantastic. Love it. Congrats on working in your new studio! You HAVE to get him to autograph that! Wow! You are about as artistic as art can get! Talk about Talent! Great he is coming to Tensleep! He was at our library here a couple months ago. 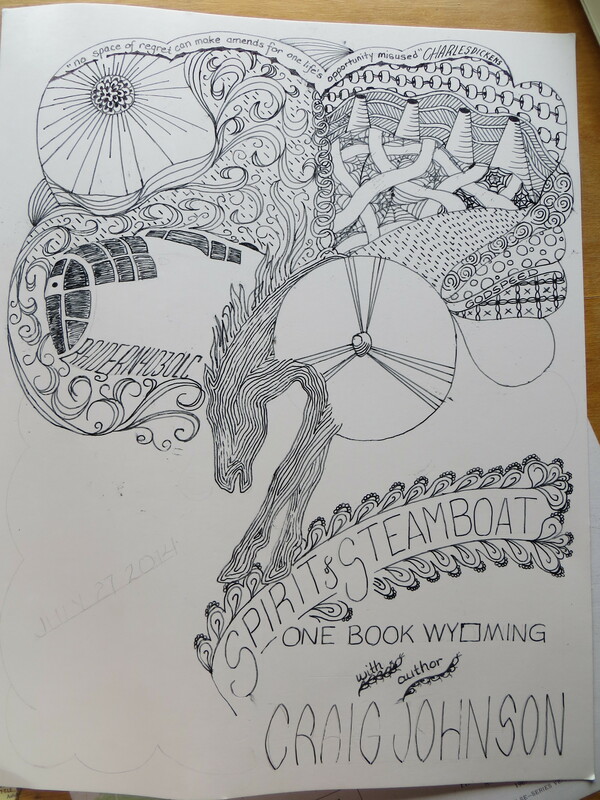 We have two copies of ” Steamboat” that we are passing around. I am listening to the Beatles album Yellow Submarine right now, and decided to go see today’s blog entry….. How’s that for serendipity? Love the poster! Beautiful! Thanks so much for telling us about Craig Johnson. I’ve read all the books except the latest, which I have but am saving! 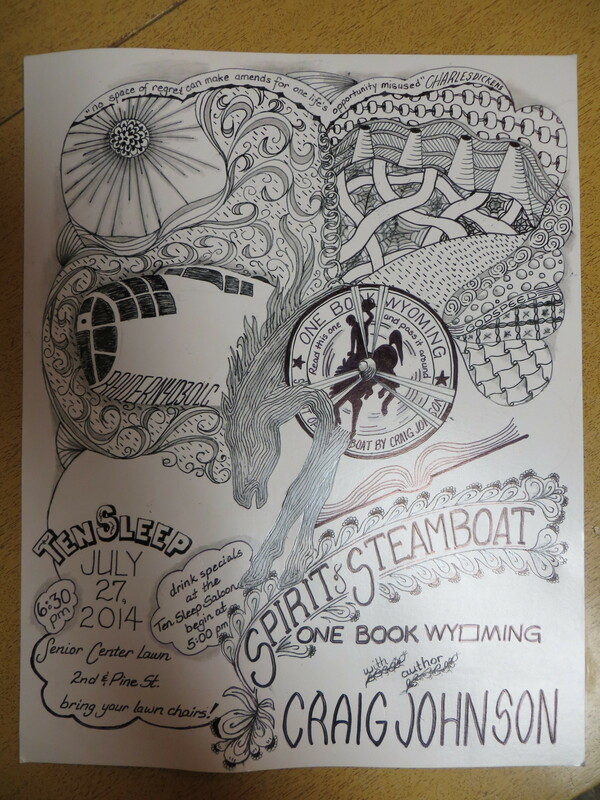 Spirit of Steamboat was a great read. Nice! I love the horse head and legs in the center!! Did I read this correctly and you are NOT going to use this poster for the official one? I think it is fantastic and very clever…& the book is a great “read”. How exciting to have Craig come to your library. * on another note, is it possible to get another of your mugs? Mine is getting very worn out from its daily use and I was needing another. Do you have any around for purchase?